At James Grassick Racing we endeavour to train the horses as an individual athlete. When training horses, fitness is just one part of the training regime. The horses equally have to understand what is required of them as a racehorse. Therefore the training of their understanding of the bridle, jockey etc., creates a better understanding between horse and rider. By doing this, one allows the horse to be calm and not stressed. This will help realise the horses’ full racing potential. James Grassick Racing is driven by optimising the Thoroughbred as an athlete, just as one would with a human athlete. By improving the way the horse moves through appropriate training, feeding etc., the racehorse can realise its full potential. 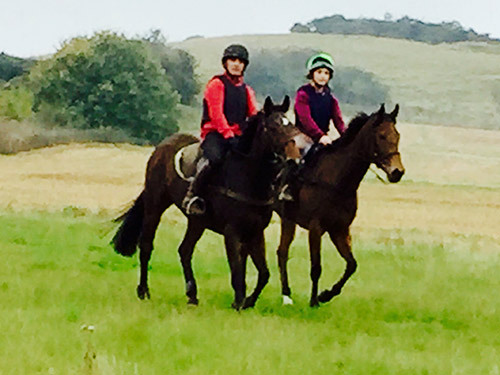 We train both National Hunt and Flat racehorses. We believe that the core point of owning a racehorse is about having fun. When choosing a racehorse trainer, it’s very important to deal with people who are friendly and approachable. James and Natasha are both full of fun and enthusiasm. It is important to Natasha and I that we enjoy the process as much as you. The whole business is one where we are all involved and have the same aim for success.